Failure to destroy both datacores in the prescribed time results in the color having to repeat which includes all adds. It will also spawn an additional add called a Rectifier which will have to be dealt with. Recognizer – Spawn on Blue (1st) and Purple (3rd) phase in 2 waves of 2. 15k HP and die quickly. During each color phase 2 spheres will spawn that will circle the room with the color of that particular phase. Those who are channelers or standing in the center of that phase will need to each kill one of those spheres. They only have about 5k HP and die fast. If you do not match the color of the sphere and you hit it with an AoE, not only do you run the risk of destroying it, but it will also stun you constantly until destroyed. If it is destroyed by someone not of the proper color then you will run the risk of being without a color to deal with the Deletion Protocol mechanic in phase two which will one shot the targeted operation member. Blue Phase: Everyone run in and kill the two patrolling mobs. They die quickly and don’t really need to be tanked. 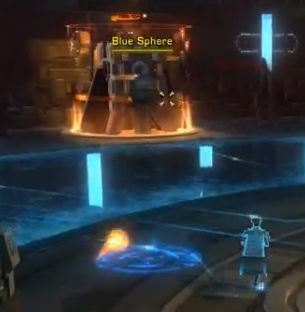 The blue dps will need to find the blue sphere and destroy it before going to channel. The blue healer will go to the center and begin to heal. Between heals the blue healer can destroy their blue orb. Tanks will run to the back of the room and pick up the Recognizers that spawn. The DPS will destroy the data cores and toss some dps onto the Recognizers as they pass by. Orange Phase: The orange tank will break off and begin to channel once the ranged dps is in the center. The remaining tank will need to pull the Regulators within range of the center dps so that they can help kill it but don’t forget to kill the orange sphere somewhere in between. Interrupt any End of Line knockbacks. Healers will heal as necessary but it couldn’t hurt to possibly toss some dps onto the Regulator. Having two up at the same time can be a bit troublesome due to knockbacks. DPS will destroy datacores. Once that phase is over the channeling tank will need to seek out and destroy their sphere. Purple Phase: DPS can take a moment to help burn down any remaining Regulator(s) that are up as this is a good phase to ‘fail’ on purpose. This is due to the fact that the adds that spawn during this phase are easy to kill. The purple healer will stand in the center and kill their sphere when they can. The purple dps can kill their sphere now or during the repeat of this phase. Either way, channel as soon as you can to at least destroy one datacore before failing. When the phase does fail it will spawn a Rectifier add which will need to be tanked facing away from the ops group to avoid 8k cleaves. DPS kill this add as well the respawns of the Recognizers before finishing off the datacore. Yellow Phase: As soon as the last purple phase datacore is destroyed the yellow tank and the yellow ranged dps will need to get in position and start channeling. Since this is the shortest phase you can’t waste any time. The yellow dps in the middle can destroy their orb at anytime but the tank will need to destroy theirs after the last datacore is destroyed. The DPS will burn down both datacores as quickly as possible, but when they do there will likely be an add (maybe 2) up. When this happens, the yellow tank will need to taunt the Operator IX boss THEN go after their yellow sphere. This will keep the boss off the healers for a few moments while the dps focus on killing the remaining Regulator droids. 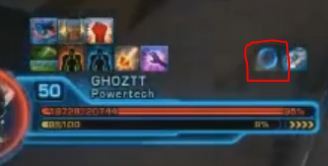 The DPS should not touch the boss until the Regulator droids are down. Once the droids are destroyed the orange tank that was on the Regulators can taunt the boss, giving the yellow tank time to finish killing their sphere. This transition is a little tricky but we’ve found that it reduces the risk of a tank getting one shot. Finally we get to see what the spheres do! Now if you did this right then everyone should have a buff as seen above. This is to handle the Deletion Protocol that Operator IX will cast on a random ops member. The boss will pick someone at random and cast a color on them in the form of a big circle. The best way to handle this is for the affected member to run to the center while someone who has the color of the circle stands next to them which will save them from being ‘deleted’. We rotate the tank/healers in first then, if a second of the same color occurs then the dps goes in. If two people of the same color runs in then both member’s buffs will be cleared and you will be left without one and hoping that the color doesn’t come up again. As long as everyone remembers what color they are and what colors have been used this mechanic isn’t too terrible, but due to the amount of activity going on it can be hard to remember. Just pay attention and remember where you need to be. Aside from this new mechanic, you now have 8 seconds on the Black Obtuse countdown (opposed to 10 seconds in story mode). There are also two adds that spawn about every other Black Obtuse but they die quickly. Good luck and have fun!